Dr. Surdykowski earned his Doctorate of Optometry from the University of Waterloo School of Optometry in 1986 after completing his Honours Bachelor of Science degree in 1982. His solo family practice of optometry at Frederick Plaza was established in 1990. A Kitchener-Waterloo native, his clinical interests include diagnosing and treating ocular disease, contact lens fitting and assessment, and laser vision correction management. He has been the clinical director at TLC Laser Eye Centers since 1999 including Canadian directorship and membership in the Clinical Directors Advisory Group, ensuring standard operating procedures and highest standards of care are maintained in laser perioperative care. Dr. Surdykowski is certified in the use of therapeutic pharmaceutical agents in Ontario. He maintains licensure and good standing with the College of Optometrists of Ontario and is a member of the Ontario Association of Optometrists. 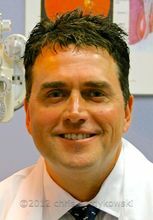 He received the Dennis Kennedy Excellence in Eye Care Award in 2003 for excellence in laser vision correction. Dr. Surdykowski has been on faculty at University of Waterloo School of Optometry and is a clinical advisor for optometry students studying refractive surgery. He has media credits on both radio and television including a 2011 TSN feature on laser vision correction in sports with PGA golfer, Mike Weir. “I believe listening is an important part of the eye examination. After truly hearing a concern, we can examine with current technologies and determine the cause of a given eye problem. Dr. Anson Chan is a graduate of the University of Waterloo, Class of 2001, with an externship at the University of Alabama in Birmingham. He was an active researcher at the School of Optometry in the field of contact lenses and refractive surgery. He has been a clinical adjunct lecturer at the School of Optometry, Primary Care Department since 2006. Dr. Chan has had a practice in Kitchener since 2002. He is an associate with TLC Waterloo as an on-call optometrist. Our office is easily accessible by car or by bus. We’re conveniently located in Frederick Mall, one block from the Conestoga Parkway (Highway 85). We offer free parking and are also wheelchair accessible. To see your world clearly, give us a call and book an eye exam today. You can also stay in touch by liking our Facebook page.